A thruster that moves game objects using the Transform.position property. It does not require or use the Unity physics engine. It is best used on GameObjects that do not have a RigidBody. Compared with PhysicsThrusters (like BThrusterForce) it provides an improved precision, considering that the GO are not affected by other forces (like collisions, gravity and so on). It applies the force to the rigidBodyToPush in the current Up direction of this GameObject, this adds more flexibility as in you can attach the thruster to a different GO than the affected GO. To decide which direction to push you can rotate the thruster GO. The position is updated (if the thruster works) each frame (Update), and it is based on the following params: this GameObject rotation, throttle and speedPerSecond. Like all thrusters, it is compatible with most of the Thrusters.Helpers components, including but not limited to controllers (player or animation based) or special effects (Light, Audio and Particles). The Thruster is built for objects with Transform (2D/3D but not UI elements). The Game Object to move when the thruster is running. It will be moved in the thruster Green Axis (up) GO direction. How fast the object should move. Speed is multiplied with throttle and added each second as unity distance unit on transform. Default throttle update value for each time the Accelerate() function is called. Save value is used for Decelerate() but with a negative sign. Check how much the GO was moved, for debug purposes. The distance (in unity units) that was added to the affected transform last frame. Minimum value (inclusive) of the throttle/engine power. Non-zero if you want the object never to be still. Maximum value (inclusive) of the throttle/engine power. Ignition state of the thruster. If on means the throttle can be applied (if no faults are present). Get the current throttle value as a value between 0-1 (based on the min/max/current throttle). Get the current throttle value as a value between 0-100 (based on min/max/current throttle). The current raw value of the throttle. It is always clamped between min/max. Flag used to keep track if any controller accelerated (at least once) during the current frame. Turn on the thruster (set the ignition on). Turn off the thruster (set the ignition off). Toggle the ignition, if it is On it will turn it off and viceversa. Checks if the engine is actually running. The ignition must be on and free of problems. The ignition is on, thruster is powered. It does NOT guarantee the thruster is working, see faults. The ignition is off, thruster is not powered on. Checks if the thruster has any problems/faults. true if the thruster is temporarily broken. Checks if the engine is free of problems/faults. Add a new problem to this engine. It disables the engine until all the problems are removed. faultUniqueID Each problem must have an unique string id. Remove a fault (problem). If the fault was the last one (in the list), and the ignition is on the thruster will resume it's effect. Remove all current faults, restoring the thruster to its original state. Get a list of all current fault ID's. fault list clone with ID's. Increase the thruster throttle with the accelerationThrottlePerFrame. To modify the throttle with a specific value use AddThrottle(); The new value is always clamped between min and max throttle values. Add (positive value) or substract (negative value) the throttle value. The new value is always clamped between min and max throttle values. addValue Positive to increase, negative to decrease the throttle. Set a new value of the throttle. The new value is always clamped between min and max throttle values. Set a new value of the throttle, based on a percent unit interval 0-1. The throttle value will be relative of min/max. newNormalized 0 will set the throttle to the minimum value, 0.5f at half and 1f at maximum. Set a new value of the throttle, based on a percent interval 0-100. /// The throttle value will be relative of min/max. newNormalized 0 to set the minimum value, 50 to half and 100 to maximum. Set the throttle to it's minimum value (see MinThrottle). Usually min is 0 and this command is used for Stop. 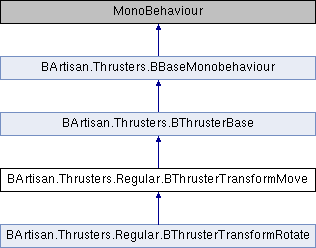 Referenced by BArtisan.Thrusters.Helpers.Controllers.BThrusterKeyController.Accelerate(), and BArtisan.Thrusters.Helpers.Controllers.BThrusterContinuousController.RestartCoroutine(). Set the throttle to it's maximum value (see MaxThrottle). Full speed ahead! Get the throttle raw value (absolute). Easy check if the throttle value is equal to MinThrottle. Easy check if the throttle value is equal to MaxThrottle.